Iain Rowan grew up in Kent, but has lived in Sunderland for 27 years. He was first published at the age of ten, with a poem in a print anthology and broadcast on radio, but after many years of basking in this heady success decided it was really time to write something else. Since then he’s had over thirty short stories published, and has been shortlisted for the Crime Writers’ Association Debut Dagger, for the Bath Novel Award, and for the Northern Writers’ Award. Iain is working on a rewrite of a novel and the Arvon Award will fund a retreat which will be invaluable in creating intensive, uninterrupted time to immerse himself in that process. 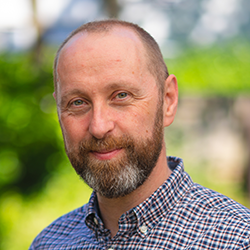 Iain is Director and founder of the month-long Sunderland Festival of Creative Writing which ran in 2016 and in 2018, and he founded the writers’ group Holmeside Writers, which has been running in Sunderland for over four years. Iain’s led some interesting collaborations between writers and the Northern Gallery for Contemporary Art, has been a judge in each year of the Sunderland Shorts Film Festival, and was one of a group of writers invited to represent new British writing at the Zocalo International Book Fair in Mexico City.